The week’s hottest temperature was 110 degrees Fahrenheit (43.3 degrees Celsius) in Diffa, Niger. The week’s coldest temperature was minus 99.0 degrees Fahrenheit (minus 72.8 degrees Celsius) at Russia’s Vostok base, Antarctica. The most powerful thunderstorm on record, with an electric potential of 1.3 billion volts, has been measured by scientists from Japan and India. They made the novel discovery by using a muon telescope located in Southern India to estimate the intensity of the record storm by measuring the flow of the high-energy muon particles it blocked. Muons are subatomic particles that rain down after being created when cosmic rays collide with Earth’s upper atmosphere. Stanford scientists have proven they can use solar power to convert salt water taken directly from San Francisco Bay to create hydrogen gas. On a larger scale, the process could achieve a truly pollution-free and carbon-neutral energy source to power cars and other devices. Current methods of splitting water into hydrogen and oxygen require the use of expensive purified water, which doesn’t corrode the electrodes that produce the splitting as does seawater at high voltages. The researchers found that by using electrodes rich in negatively charged layers of nickel-iron hydroxide and nickel sulfide over a nickel foam core, the corrosion is significantly reduced. The week’s hottest temperature was 110 degrees Fahrenheit (43.3 degrees Celsius) in Diourbel, Senegal. The week’s coldest temperature was minus 89.0 degrees Fahrenheit (minus 67.2 degrees Celsius) at Russia’s Vostok base, Antarctica. Thousands of school pupils worldwide have abandoned classrooms for a day of protest against climate change. India, South Korea, Australia and the US are among the countries where teenagers are already on strike. The day of action is expected to embrace about 100 countries. The globally co-ordinated children’s protests – promoted through posts on Twitter and other social media – have been going on for several months. 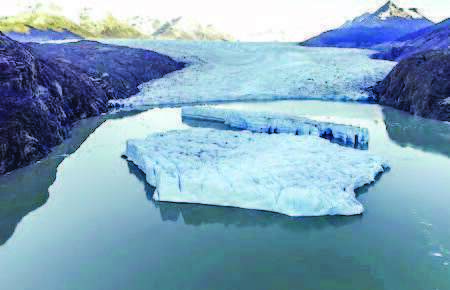 The most significant glacial ruptures at Chile’s Grey Glacier in Patagonia since the 1990s saw two new icebergs break off in the last three weeks, sparking concerns that such ruptures are becoming more frequent due to climate change. A larger break-off of glacial ice occurred in 2017. Scientists say recent above-normal temperatures and heavy rain could also be factors in the latest ruptures. The week’s hottest temperature was 116 degrees Fahrenheit (46.7 degrees Celsius) in Dampier, Western Australia. The week’s coldest temperature was minus 79.0 degrees Fahrenheit (minus 61.7 degrees Celsius) at Russia’s Vostok base, Antarctica. A major species extinction event, compromising planetary integrity and Earth’s capacity to meet human needs, is unfolding,” the report says, listing threats to ecosystems, fisheries and other major systems. It notes conservationists are divided on whether Earth is in a sixth mass extinction. Land is getting less fertile and useful. The report says degradation “hot spots,” where it’s difficult to grow crops, now cover 29 percent of all land areas. 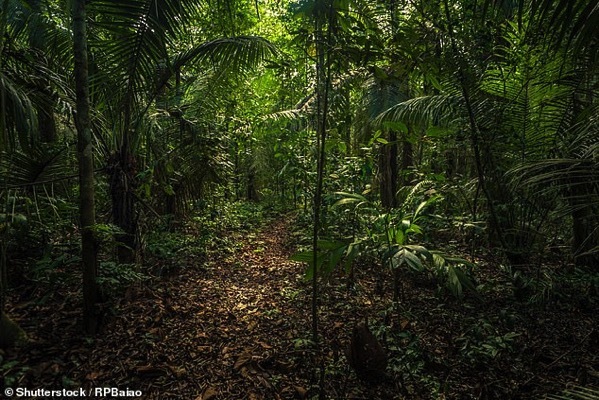 The rate of deforestation has slowed but continues. There is so much carbon dioxide in the atmosphere that solely planting trees won’t be enough to save humans from global warming, a study has revealed. It was recently found that young trees can absorb carbon dioxide better than established tropical rainforests, which seemed to be a dose of good news. 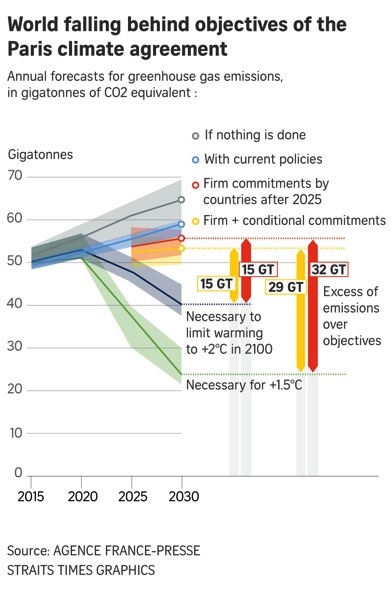 But research has found there just isn’t enough space on earth to plant the amount of trees that would be required to make a real dent in our carbon emissions. It has been calculated that if we planted 1.7 billion acres of trees, we could remove 3 billion tons of atmospheric carbon a year, according to Business Insider. That’s about 10 percent of what humans emit every year, which can total up to 40 billion tons. Scientists have looked at trees as a potential solution because they remove carbon dioxide from the atmosphere during photosynthesis, using it to form carbohydrates that are used in plant structure and function. Trees also release oxygen back into the atmosphere as a byproduct. But 1.7 billion acres of trees would be equivalent to the entire contiguous US. And planting that many trees would cover half the land that is used to farm crops worldwide, plus land we would need to eventually farm as populations continue to grow. Thus, studies have found that this solution could actually lead to starvation of the human population. Rain is becoming more frequent in Greenland and accelerating the melting of its ice, a new study has found. Scientists say they’re “surprised” to discover rain falling even during the long Arctic winter. 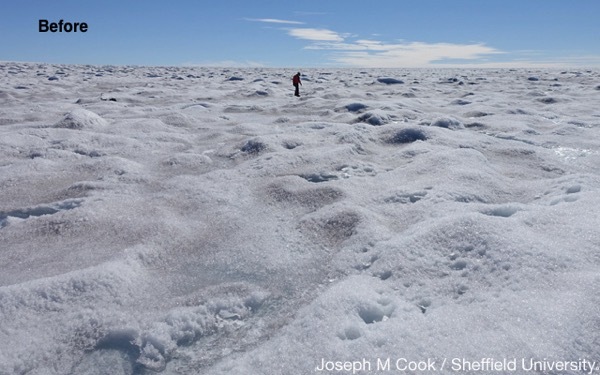 The massive Greenland ice-sheet is being watched closely because it holds a huge store of frozen water. Precipitation usually falls as snow in winter – rather than as rain – which can balance out any melting of the ice in the summer. Even if it falls during winter, and then quickly refreezes, the rain changes the characteristics of the surface, leaving it smoother and darker, and “pre-conditioned” to melt more rapidly when summer arrives. 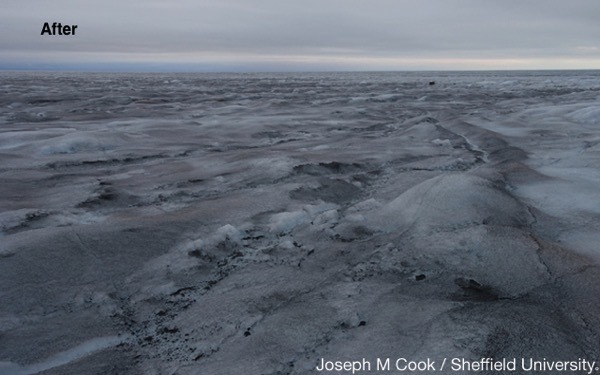 The darker the ice is, the more heat it absorbs from the Sun – causing it to melt more quickly. Whereas in 1979 there were on average 2 spells of winter rain, by 2012 the analysis found there were 12 spells of winter rain. In stable times, snowfall in winter will balance any ice melted or breaking off into the ocean in summer. But research has shown how in recent decades the ice-sheet has been losing vast amounts of mass. Researchers studying Antarctica’s McMurdo Ice Shelf have discovered that thousands of tiny “ice quakes” occur there each day. The scientists from the University of Chicago believe they are caused by pools of partially melted ice as they refreeze at night. “As the temperature cools at night, the ice on the top contracts, and the water below expands as it undergoes freezing,” said glaciologist Douglas MacAyeal. “This warps the top lid, until it finally breaks with a snap.” He and his colleagues believe using seismometers such as theirs elsewhere in Antarctica may help other scientists track glacier melting. The week’s hottest temperature was 116 degrees Fahrenheit (46.7 degrees Celsius) in Eucla, Western Australia. The week’s coldest temperature was minus 71.0 degrees Fahrenheit (minus 57.2 degrees Celsius) at Russia’s Vostok base, Antarctica.